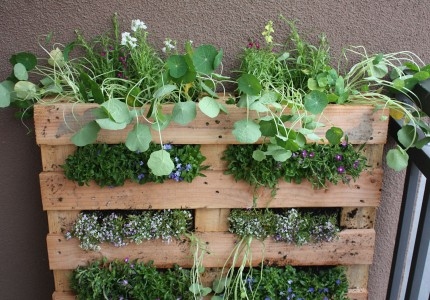 Vertical gardening as an innovative method of urban greening may be just a few decades old, but vertical gardens have been part of human culture for millennia as is evident from the ancient gardens of the Mediterranean. Ivy-covered cottages and trellises with climbing roses and sweet peas are more recent examples of vertical gardening. Here's the Difference - Natural climbers and flexible plants that could be trained up a wall or wire, while their roots stayed firmly in the ground, made up the bulk of the vertical gardens of old. Now, hydroponics and soil-free growing mediums have made it possible to grow all kinds of plants vertically. Although the idea of greening the cities is the driving force behind the new, hi-tech, vertical gardens, you can grow ornamentals and vegetables vertically whether you live in the city or in the country. Here are some very good reasons why you should. It’s always attractive to get more out of less when space is premium, particularly in the smaller plots of land we find in towns and cities. When some plants like runner beans, peas, cucumbers, and tomatoes are grown on poles or trellises, the space in between them can be utilized for leafy vegetables that can manage with less light. Even if you have a large yard for an expansive vegetable garden, the advantages of growing more food in less space are many. Gardening chores such as removing sod, preparing the beds, tilling and turning the soil are considerably reduced. You save on the expense of watering and spraying fertilizers and pesticides over a larger area. Time and effort spent on weeding can be reduced. Plants get more focused attention too. When plants are trained on to vertical supports and allowed to grow upwards, they produce more fruit. This has been known to be true in the case of espaliered trees with controlled lateral growth. The yield of tomato plants is increased several fold when they are grown as single-stem vertical plants with ample support. The main reason is that leaves get more sunlight, enabling them to make more food. Vertical growth gets the plants more attention compared to trailing growth on the ground. They are easily pruned to maintain the vigorous upward growth of the main fruit-bearing stem. Strawberries, squashes, cucumbers, and smaller varieties of pumpkins can be grown on trellises for a higher yield. Besides getting good exposure to sunlight, vertically grown plants get plenty of air circulation, which keeps them healthy and relatively free of diseases. Tomato plants are the perfect examples again. When left to grow naturally, a single tomato plant can have spreading growth with profuse branching that covers a 4x4 sq ft. area. The low growth and crowding of leaves can result in diseases and rot. With weeds growing all around, and with leaves and the tomatoes lying close to the ground, pest problems also could be higher. Backbreaking harvesting chores are a nightmare for people suffering from arthritis and other painful conditions. Having to bend down to pick the produce practically takes the joy out of growing edibles. When grown vertically, it is easier to check the fruits and vegetables for their ripeness and pick them at the right time. Many root vegetables like carrots, radishes and turnips can be grown on vertically arranged soil pouches. The vegetables can be simply shaken out of the soil pouches when they are ready. That saves the trouble of digging them out from the ground. Spinach, lettuce and other leafy vegetables also grow well in vertical systems. Picking the salad greens is a breeze when you have them at a comfortable height. If you have cats, dogs and free ranging chickens, you know how hard it is to keep them off your flowerbeds and vegetable patches. Actually, it is the soil that they want to scratch and dig up, not your precious plants, but they can't resist the loose and damp soil in the well-made beds. Growing plants off the ground is a good solution. As for climbers growing in the ground, you can protect their bases until they are strong enough to hold out against such aggression. There are many ornamentals that are toxic or thorny, and potentially dangerous to pets. You can ensure their uneventful coexistence by growing such plants in hanging baskets well out of their reach. If wildlife, such as rabbits, earwigs, or snails regularly trouble your well-tended garden, protect your precious plants by growing them in a series of hanging troughs or baskets. A vertical arrangement of ornamentals or climber-covered trellises can be used to segregate different areas in the garden such as cutting garden, entertainment area, kids’ play area, etc. They can act as excellent privacy screens around swimming pools and between yards. Within the house as well, "living wall" room dividers can be quite charming, besides refreshing the air. Server responsed at: 04/19/2019 8:42 a.m.